One beautiful, sunny African afternoon, my life changed forever. For two years, I had asked my gynaecologist for a mammogram. For two years, he had told me it wasn’t necessary. Finally another specialist sent me for a “routine mammogram and ultrasound” which turned out to not be as routine as I’d hoped. I had breast cancer. And because it hadn’t been discovered earlier, it had already spread to the glands and beyond. It was like when you are tearing along the road, enjoying the scenery and eager to arrive at your destination, and all of a sudden the road turns back on itself. You jam on brakes and grip the steering wheel in an effort to keep the car under control as you attempt to navigate the U-turn you hadn’t seen coming. I jammed on brakes, gripped my steering wheel, and sped into battle against what turned out to be an aggressive form of cancer. With the use of a skilled surgeon, an unconventional and courageous oncologist, a supportive family, and a team of praying friends, God pulled me through that dreadful year of treatment. Not only did I survive the U-turn, I found myself traveling, as you do with a U-turn, in a different direction. I went from being a nursing sister (RN) to being a published author. God promises in His Word that in all things God works for the good of those who love him (Romans 8:28). It took me a while to see it. But I eventually realised how many invaluable lessons God taught me during my “cancer year” and beyond. And it wasn’t long before He prompted me to share these lessons with others in the form of meditations. One verse that followed me throughout the whole cancer experience: “They that wait upon the LORD shall renew their strength; they shall mount up with wings as eagles” Isaiah 40:31. I wanted so badly to have my strength renewed, but how do you wait on anyone, even the Lord, when you are told you have cancer? The Lord was ready and willing to teach me. Sometimes I got it right, and sometimes I didn’t. But gradually and patiently He led me through many bumpy experiences, and I emerged from the journey closer to Him than ever before. In Strength Renewed you can read about 90 of these times, and it is my prayer that you will be be blessed and helped as you navigate the U-turn in your life–hopefully with more control over the steering wheel than I often had. 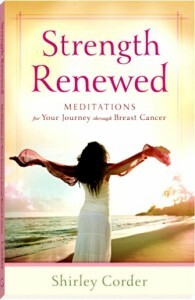 Strength Renewed, Meditations for Your Journey through Breast Cancer! Or you can preview or even purchase this book by clicking on the relevant tab below the following image.